Travel across the vast Namibian deserts and through national parks in a customised overlanding truck on this true African adventure. From searching for wildlife in Etosha National Park to climbing some of the largest sand dunes in the world, this trip covers Namibia's highlights. Arrive in Namibia's capital, Windhoek and check into the hotel. Depending on your flight arrival there is free time today for sightseeing, with an opportunity to visit the National Museum or perhaps a half day Katatura Township tour before an evening welcome meeting. Early this morning we leave Windhoek to drive to Waterberg Plateau Park. Throughout this trip we'll travel in overlanding trucks that are perfectly equipped for Namibia's bumpy roads! These large vehicles are custom-designed with lots of space, sufficient luggage storage and hardy tyres to ensure comfort even in Namibia's wildest environments. Waterberg Plateau National Park is mountainous and resembles something from The Lost World with lush vegetation and thick woodland which remains well protected by the natural topography. This afternoon there will be the chance to go on a 90-minute hike along the well-marked trails up to the plateau which offers panoramic views of the park below while searching for the elusive Damara Dik-Dik and a variety of birds. Alternatively, there will be the option to book a game drive in search of the park's rhino, giraffe and leopard. Tonight we'll camp in the foothills of the plateau and the crew cook up the first dinner of our camping experience. Throughout the trip, the evening meals will vary depending on the time of arrival at camp but all leaders and crew have their own specialties! Examples include barbecues, pastas, stews, beer can chicken and potjies - a traditional meal cooked in a three-legged black pot. Fresh produce is bought every few days in the larger towns and some crews have been known to bake bread and cake in the fire with two gas burners and a fire! Please note: Although the vehicles are a great match for the terrain, Namibia's roads in the more rural areas can be very bumpy and many are merely gravel tracks so tyre blow-outs can happen! The crew are all trained and equipped to deal with such situations when they occur. We leave Waterberg this morning to begin our journey to Etosha National Park, but first we'll visit the Cheetah Conservation Fund (CCF) at Otjiwarongo. The CCF is an internationally recognised centre of excellence in research of cheetahs and their ecosystems. The extensive visitor's centre encourages visitors to learn more about these elusive cats and the efforts being made to protect them. While our local guide gets lunch prepared, a member of the CCF team will talk us through how the centre works on a guided tour, including the education centre, museum, clinic, creamery (where fresh, homemade feta cheese is produced) as well providing the chance to meet the resident cheetahs, dogs and livestock that live at the centre. Today we'll have a picnic lunch before continuing to Etosha National Park. Picnic lunches will vary throughout the trip as the crew always try to make something a little different each day; sandwiches, a selection of cold meats and cheeses, or sometimes a pasta or couscous salad are some examples. Etosha National Park is arguably one of Africa's finest safari spots, where we'll have our first game drive in our overland truck on the way to this evening's camp. Home to four of the Big Five (there are no buffalo but they can be found at Waterberg Plateau! ), Etosha's geology makes it a unique setting for a safari as it's made up of a mix of thick vegetation and dry, barren salt pans. During the drier, winter months between April and October our campsite is perfectly positioned to be able to pull up a chair with a glass of wine and watch rhino, elephant and great herds of springbok at the nearby waterhole. In Namibia's summer months, the campsite offers fantastic views but the watering holes are quiet as there is plenty of water in the veld for the wildlife. An early start kicks off a full day of safari. Covering over 12,400 square miles, Etosha is home to 114 species of animals, including elephant, black rhino, leopard, cheetah and lion and over 300 bird species. Today is flexible depending on what sightings have occurred in the park most recently and we'll take a picnic lunch to make the most of our safari time. The park's terrain ranges from dense bush to large open plains where animals can be seen roaming against the hazy backdrop or congregating around one of the waterholes. We return to our camp this evening to enjoy another night under a starlit sky, with only sounds of the wild and light from the campfire. One last game drive this morning will be followed by a picnic lunch in Etosha National Park before we leave to visit a traditional Himba community. The Himba people are indigenous to northern Namibia and Southern Angola, and are a semi-nomadic tribe. Their simple lifestyle has remained unchanged for generations and many still wear traditional animals skin coverings and headdresses. The women of the communities often cover themselves in a paste of made of butter, fat and red ochre to protect themselves from the sun and mosquito bites, as well as being a traditional form of beautifying. We'll have a guided tour with a trained Himba guide who will explain the many different Himba customs, such as which milestones are depicted through a woman's choice of hairstyle, as well as the significance of smoke and fire ceremonies and what a traditional home looks like. We are keen to highlight that this is a cultural exchange and the two Himba communities we visit in Namibia are working hard to protect their simple way of life. The community kindly request that no gifts of any sort are given to the children, extra tips should not be given and that all rubbish is taken away so they continue carefully sharing their story without damaging their culture. Later this afternoon we'll make our way to Toshari Lodge, where we'll be setting up in the private campsite. Our tents will be pitched in the shade of mopane trees and depending on the time of the year, may have time for a dip in the lodge's pool or a drink at the bar. A half-day drive takes brings us to our next campsite that sits in the shadows of Brandberg Mountain, Namibia's highest peak reaching 2,573m. On arrival we'll have a picnic lunch before we set off on a hike to see one of the most iconic examples of rock art in Namibia, The White Lady. The White Lady is the most well-known example of rock art in the region but it's estimated to be just one of approximately 45,000 in the area and is thought to date back 2,000 years. To reach the rock paintings we will walk along mostly flat terrain between rock formations for approximately one hour each way. As the region can get very warm, comfortable walking footwear, a hat, suntan lotion and plenty of water is essential. Camp will be set-up in the grounds of the private Brandberg White Lady lodge, so when we return, depending on the time of year, there may be time for a quick swim, a cold beer at the bar, or just a chance to relax in the late afternoon sun. Travelling west towards the Atlantic coast, our first stop today will be an encounter with thousands of Cape fur seals at Cape Cross. This headland is protected as the Cape Cross Seal Reserve, and offers the opportunity to see these charming marine mammals in abundance either lying in the sunshine or swimming in the surrounding waters. The number of seals found on the cape depends on how healthy the fish population is at the time but tends to remain between 80,000 - 100,000 at any one time. This evening we'll arrive in Swakopmund to see its surreal German architecture. Here we can enjoy the comfort of a proper bed in the small lodge that is a our home for the next two nights. Today is free to relax and explore Swakopmund. Once a busy port town, Swakopmund played an important role in what was once German South West Africa and is rich in infamous colonial history. Pinned between the vast Namib Desert and the thrashing Atlantic Sea, Swakopmund has the look of a European holiday town where you can enjoy a good German beer or choose to go on a boat trip in search of dolphins. We'll depart for Sesriem this morning travelling via the tiny desert town of Solitaire and along the Kuiseb River Canyon. A stop at Walvis Bay Lagoon will offer the chance to see the largest flock of blush-pink lesser and greater flamingos in Southern Africa, as well as Damara terns, pelicans and avocets. During the summer months of October to April approximately 150,000 migratory birds can also be seen in the area, offering exciting photo opportunities and bird sightings. We'll continue our journey this afternoon to arrive in Sesriem, an isolated desert hamlet and the gateway to the Sossusvlei region of Namib-Naukluft National Park. Our campsite this evening is a simple affair but is a prime spot from which to explore the dunes. The camping pitches are on sand under huge camelthorn trees giving a real desert camping experience including a natural morning alarm clock of barking geckos. Once camp is set up, there will be time for a shower or to have a beer before dinner and an evening around the campfire. Today we see an other-worldly side to Namibia in the Namib-Naukluft National Park where barren salt pans, dotted with blackened, scorched trees, cover the landscape between huge sand dunes. 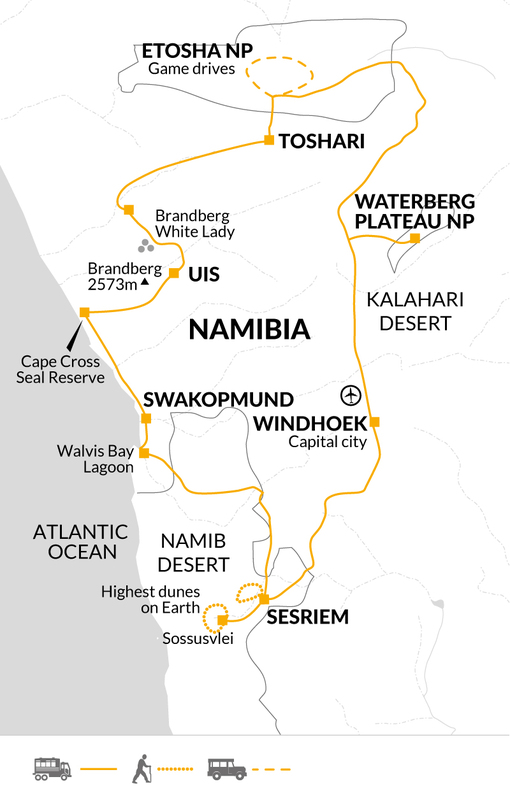 We'll visit both the Sossusvlei and Deadvlei regions, visiting the largest sand dune in the area fondly called Big daddy standing at 325 metres tall and we will walk in the Sesriem Gorge later this afternoon. Carved over 15 million years ago by the once powerful Tsauchab River, the gorge exposes the multiple layers of rock and sands along the scenic walking trails. Depending on both time and weather, we'll aim to enjoy the changing colours of sunset at Elim Dune, where the tall, sand mound becomes a vibrant orangery red in the sunlight on a backdrop of the Naukluft Mountains. For keen photographers, the changing light at this time of day offers unique photo opportunities. We will return to camp this evening for dinner. Clothing should be lightweight and it's all about layers! Also between May and September, Namibia's winter months, a warm fleece/jumper is essential for nights and early mornings which can get cold and a waterproof/windproof jacket is also recommended. Please note that brightly coloured clothing is not suitable for game viewing. Don't forget your swimming costume in case you want to dip in a pool along the way! Lightweight trail boots or robust trainers with a good grip, and sandals. Bring a 2-season sleeping bag between Nov- Mar (temperature 0°C to 5°C) or a 3-4 season sleeping bag between Apr-Oct (temperature -10°C to -5°C), a sleeping bag liner, a towel, a fitted sheet (single sized for the foam mat) and we'd also recommend a travel pillow for camping and any napping during longer drives. Good, thick foam sleeping mats are provided and tents have sewn-in mosquito screening so nets are not required. For smaller personal items we also recommend a head torch, a reusable water bottle, a sunhat, sunglasses and high factor sunscreen. Binoculars are essential for game viewing and a 300 mm lens is recommended for photography. Although many campsites do not have electricity, you will be able to charge personal items in the truck, on our hotel nights and some of lodges where we will be camping offer charging points too. Namibia has a good tourism infrastructure and service levels overall. Hotels will be simple but clean and welcoming often with a communal area to get refreshments or relax with a book. Our chosen campsites are well set-up and maintained, often with dining areas, barbecues, fire pits, small shop and bar, clean toilets and shower blocks (facilities are shared). Most camping pitches will have a tap for running cold water and a campfire, some of the sites also offer the use of charging points for cameras and phones. Many of our chosen camping spots are within private lodge grounds with use of the facilities such as the pool, gardens and a bar. Camping is in two person tents, with the Explore leader and driver preparing the meals. One great feature of camping is that it really gives us a sense of being in the African bush as we camp under the starry skies listening to the surrounding wildlife. Everyone in the group will help with camp chores including setting up and taking down of camp and the loading/unloading of equipment. Like many adventures of this type, much of the team spirit and camaraderie is developed through mucking in with the basic camp responsibilities. The demand for rooms and camping spots in Namibia is very high so our accommodation is subject to change even at short notice. Your Explore Leader will give a group briefing at the start of the trip about locations, driving times and any alterations to the running order that be necessary. Distances between accommodations can be vast and driving times may be affected. On this in-depth, full-on trip, we'll cover vast distances to see the very best of what Namibia has to offer. From camping under starlit skies to ancient rock art, from the world's oldest desert to finding the country's Big Five, you'll come back from this trip with lifelong memories. See landscapes unlike anywhere else on Earth when exploring the huge peaks of Sossusvlei's giant red sand dunes and watch wild animals in their protected, natural environments while on safari in Etosha National park.